How much should my e-book cost? Amazon.com and SmashWords have opened the doors for self-publishing authors to distribute their e-books worldwide, and many authors are quick to take advantage of this opportunity. They upload their book files, fill in the book descriptions and other information, and then get to the question of price. How much should an e-book cost? Many new self-publishing authors are looking for the most readers possible, so they choose a low price. Perhaps the author is hoping consumers will buy the book on impulse because the price is so low. Perhaps the author thinks that the low price will result in massive sales volume, which would compensate for the lower profit per book. I see many books with a $0.99 price tag. I want to buy a book that has a sales price of $0.99. Great. Now I have to log-in to Amazon (or wherever), take the time to add the book to my shopping cart and enter my credit card information, trust that my information is safe, download the book, and pull it up in my e-reader, hoping it downloaded correctly. All those steps and emotions have value, too. I have to work to get that book, and that’s part of the full cost for the book. Ninety-nine cents may not have much value to me, but the time and effort do. Before I make the choice to engage in that purchase, I have to ask myself not just whether the book is worth at least $0.99, but also whether the effort is worth a book that costs $0.99. I may be less likely to pay the full cost for a book with a $0.99 sales price for a book with a $10.00 price tag. The perceived value of the book has to be greater than or equal to the perceived value of the full cost, monetary and otherwise. If I think it is, I’ll buy it. I want as many buyers as possible. After all, more readers means more profits. I’m going to sell my book at a very low price, but I’ll have a lot of readers and, therefore, will make a lot of money, right? Maybe not. Let’s do some math. I sell 100 books at $1 during a one-week period. I now have 100 readers and have made $100. Ok, that’s not too bad. Now I lower the price to $0.50. During the next week, I sell 175 books. Yippie! I have 75 more readers this week than last week. The lower price resulted in more sales. That’s great! But wait a minute. I made only $87.50. I increased the number of readers, but I’m making less profit for all my hard work writing that book. That’s not good. Here’s a real example. I have one e-book that I sell on Amazon for $0.99 (profit = $0.35 / book). If I sell 50 copies in a month, I make $17.50. I have another e-book that I sell on Amazon for $9.95 (profit = $6.96 per book). I sell about 1 of this book for every 4 of the other book. If I sell 50 of the lower-cost book, I will likely sell 12 of this higher-priced book, for a profit of $83.52. Thus, I sell 38 more copies of the $0.99 book, but I make $66.02 more profit selling fewer copies of the higher-priced book. As we can see, more sales alone does not equal more profit. In fact, I would have to sell nearly 20 times more lower-cost books than higher-cost books for the profits to equal. Higher prices generally mean fewer sales, though you get more profit from each sale, and lower prices generally mean more sales, though you get less profit from each sale. When we think about this, we find that a price point exists where we maximize total profit. We don’t make the most sales (lowest price), and we don’t make the most profit per sale (highest price). But we do make the most money overall for our efforts. The following image shows how book price and sales volume interact. We see from this graphic that if we have a high price, we have low sales quantity. If we have a low price, we have a high sales quantity. At some point, these two effects cross, giving us the perfect price for an e-book (or anything, for that matter). From this image, we learn three things. 1. Price above the perfect price: We make more per book, but we sell fewer books. The increased profit per book does not make up for lost sales, resulting in lower total profit. 2. Price below the perfect price: We make more sales, but we make less profit per book. The increased quantity of sales does not make up for the lower profit per book, resulting in lower total profits. 3. Perfect Price: The best price for an e-book is where we make the most total profit, not the most sales or the highest profit per book. We can find this point by tracking profits and prices carefully. I can lower the price 10% and see how my profits change. Do my total profits increase when I lower the price? If so, I need to try lowering it a bit more. Do my total profits decrease? If so, I need to try raising the price. The following image shows how adjusting the price affects total profit. 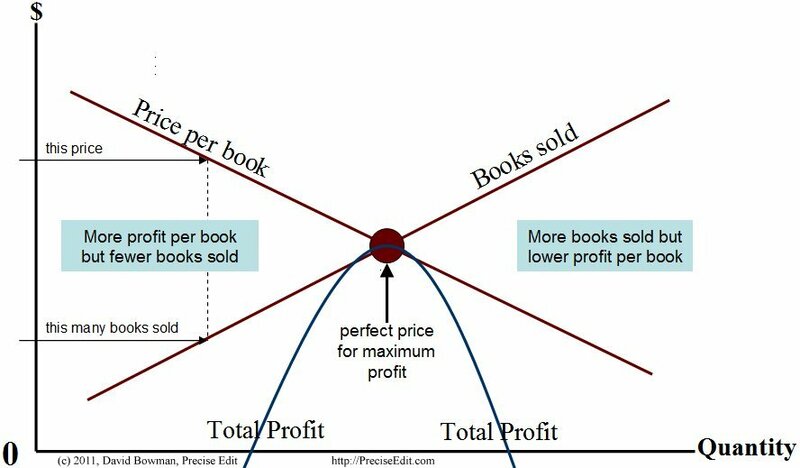 As we see from this image, if the price is above the perfect price point, we can increase total profits from book sales by lowering the price. 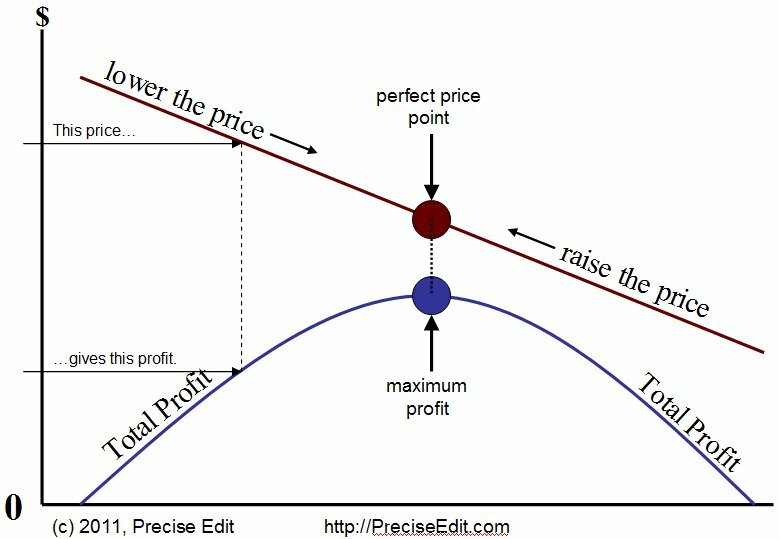 Also, if the price is below the perfect price point, we increase profits from book sales by raising the price. The only time an author should sell his or her books below the perfect price point is when he or she wants to attract new readers who may later buy a higher-priced book. Otherwise, the author is only cheating him- or herself. purchase the Kindle version ($0.99). I’m pleased you found this post useful. Authors, particularly self-publishing authors, need to do their own math in terms of sales, whether to find the right price or to gauge the effect of promotional efforts. We simply can’t depend on publishing houses to do it for us. You’ve taught me something tonight! Keep up the good work! 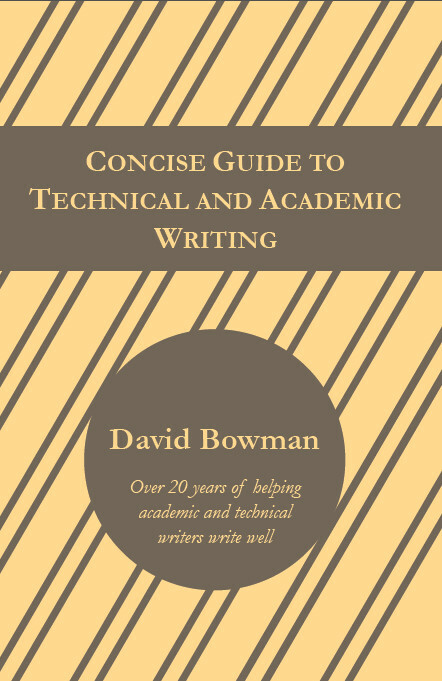 GREAT piece – this should be required reading for all aspiring self-pub authors. Selling your work for too low a price not only devalues your time, effort, and skill, but also doesn’t maximize your returns! Kate: I agree. I have 4 books of my own, and I know how much work (and cost) it is to publish a quality book. To my thinking, an author has the right to get the best possible return (i.e., profit) for his or her efforts. Have you considered pricing as promotion? It muddies the equation somewhat. For instance, I am pricing one of my books at $0.99. While I do so, the sales numbers increase, which makes my Amazon Sales Rank drop. Because of that, I get listed on top 100 genre lists, which increases the number of sales. After a month, I can raise the price to $2.99, and I benefit from the new rank by making more profit. As the sales drop, and ranking raises, I can profit from the higher price. Then, after a month or so, when the ranking has risen enough, I can drop the price again, starting the whole process all over again. While you may not make as much with $0.99 as you would with $9.99, paying attention to sales and setting the price as appropriate may profit you more than either one. Just saying that one of the nice things about self-publishing is that we can alter the price as needed, which means we don’t have to pick just one price. Brand: What you’re doing is a form of lowing the price to attract potential buyers. The lower price, if it results in a higher rank and higher listing in Amazon search results, may increase the number of people aware of your book. Then you are charging a higher price, which may reduce sales but may make you more profit in the meantime. You’re doing what I mentioned about setting the price below the perfect point in order to attact buyers to a higher price item later (even though it’s the same book). It’s a tricky strategy that must be handled with great attention and care. You have to watch the numbers closely. I completely agree that self-publishing does give you greater control over your price and that you are not bound to only one price as sales figures, and profit, change.